In this combination photo, Fox News personality Laura Ingraham speaks at the Republican National Convention in Cleveland on July 20, 2016, left, and David Hogg, a student survivor from Marjory Stoneman Douglas High School in Parkland, Fla., speaks at a rally for common sense gun legislation in Livingston, N.J. on Feb. 25, 2018. Some big name advertisers are dropping Ingraham after she publicly criticized Hogg. More advertisers are dropping Fox News personality Laura Ingraham after she mocked a Florida school shooting survivor online Wednesday. By Saturday afternoon, at least 14 companies had said that they would pull their ads from "The Ingraham Angle." On Wednesday, Ingraham tweeted, "David Hogg Rejected By Four Colleges To Which He Applied and whines about it." In response, the outspoken Marjory Stoneman Douglas High School student tweeted a list of a dozen advertisers and encouraged followers to call them and ask them to drop Ingraham. Some of the businesses listed by Hogg, including Wayfair, Nestle, TripAdvisor and Nutrish said they are removing their support from Ingraham. Others not specifically listed by Hogg, including Office Depot, Hulu, Expedia, StitchFix, Ruby Tuesday and Johnson & Johnson have also dropped Ingraham. Hogg has faced intense criticism from right-wing conservatives and gun advocates who have falsely called him a crisis actor following the Valentine's Day shooting in Parkland that killed 17. "Soooo @IngrahamAngle what are your biggest advertisers ... Asking for a friend," he wrote with the hashtag #BoycottIngramAdverts. Hogg mentioned other companies in his tweet, such as AT&T, Bayer, and Arby's, but those brands have not responded. Wayfair said in a statement that it supports "open dialogue and debate on issues. However, the decision of an adult to personally criticize a high school student who has lost his classmates in an unspeakable tragedy is not consistent with our values. We do not plan to continue advertising on this particular program." TripAdvisor says it does not "condone the inappropriate comments made by this broadcaster. In our view, these statements focused on a high school student, cross the line of decency. As such, we have made a decision to stop advertising on that program." A telephone message left for Nutrish was not immediately returned but the company tweeted it was in the process of removing ads from Ingraham's show. Those at the March for Our Lives in Washington, D.C., paid their respects to the victims of the Stoneman Douglas High School shooting in a long moment of silence, led by shooting survivor Emma Gonzalez. Ingraham apologized Thursday on Twitter, saying, "On reflection, in the spirit of Holy Week, I apologize for any upset or hurt my tweet caused him or any of the brave victims of Parkland." Ingraham tweeted that she thought she was the first to feature Hogg on her show after the shooting and added, "he's welcome to come on my show anytime for a productive discussion." 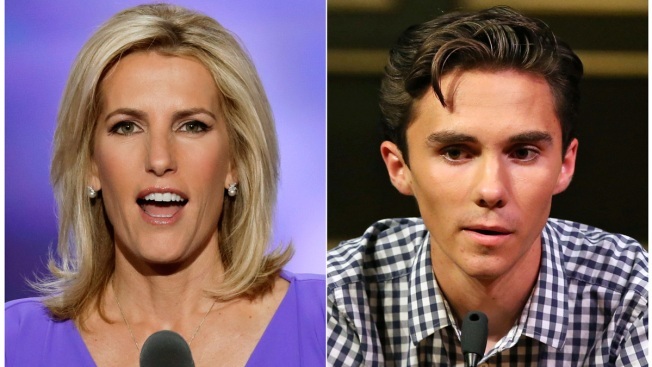 Hogg tweeted later Thursday that an apology to save advertisers wasn't enough and that he'd only accept Ingraham's apology if she denounced the way Fox News has treated his friends. "It's time to love thy neighbor, not mudsling at children," Hogg wrote.